As many of you know South Africa is known for its splendid national wildlife parks and an opportunity to see and photograph nature at first hand, especially Africa's Big 5 which includes the magnificent African Elephant (Loxodonta africana) as its largest and possibly most dangerous member. Many wildlife photographers, including myself ensure we prepare ourselves for a photographic trip the night before and get up very early the following morning to ensure we can capture natures wildlife in all its natural glory in those few hours just before and after sunrise, this we call the 'golden hours' just a few hours either side of sunrise and or sunset when the light is at its best. So with all this preparation and very early mornings, you wouldn't be surprised that normally around 8am my wife and I usually steer ourselves to one of the very splendid picnic spots South African national wildlife parks provide its customers for a much welcomed breakfast break. It was at one such picnic spot called 'Tshokwane' (named after 'Tshokwane' a South African man of 'Muti' or 'medicine man' in the area) between Kruger National Parks most famous of rest camps 'Satara' and 'Skukuza' we stopped for a 'breakfast break'. It was here that my wife and I experienced a simple and somewhat tender moment with one of South Africa's Big 5 the African Elephant. We were just finishing up our breakfast when I noticed 3 or 4 African Elephants (possibly made up of a Matriarch and some younger female siblings) come out the bush and step over a small fence separating the picnic spot from the rest of the park. Here raising their trunks they all proceeded to feed on ripe green leaves on trees just inside the picnic spots entrance. We were mesmerised, to late to move out the way we sat their quietly only a couple of meters from these magnificent animals enjoying a 'special' African Elephant moment, while they to enjoyed their breakfast. The experience lasted about 10 minutes, and they soon disappeared back into the 'bush' as quickly as they arrived. 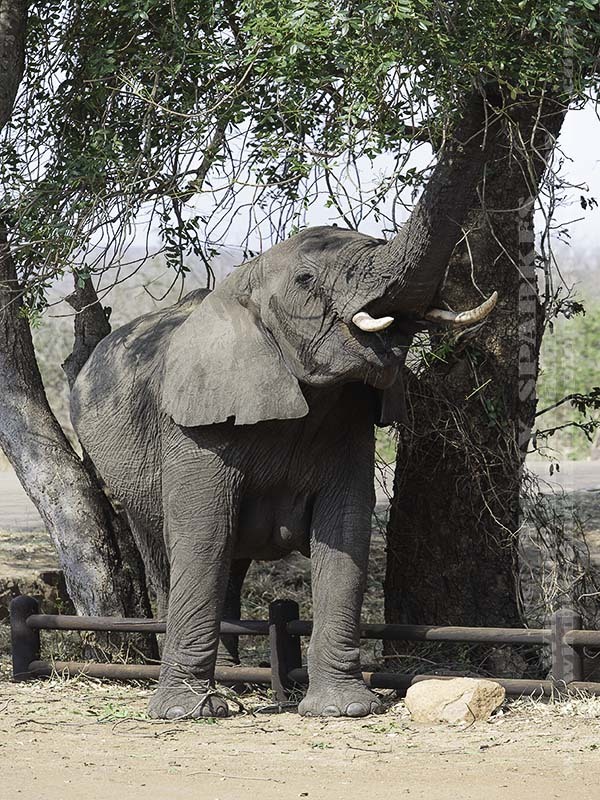 It was estimated at the last census count of African Elephants in South Africa's Kruger National Park their numbers were a little over 13,000, up considerably from 2006 when African Elephants counts were just over 700.